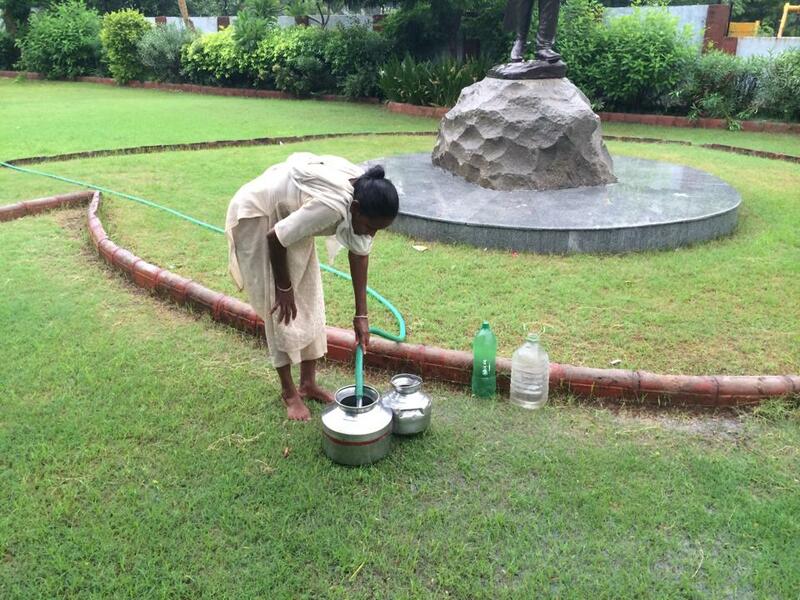 A lady fills her water containers from a hose that is constantly running in a park in Ahmedabad, India. Is this good that she has access to running water, or a concern that she is doing it in a way that is possibly unhygienic? How do we know when change is necessary or even possible? Ok, here is a question for some discussion. Why is it necessary to do a ridiculous running stunt in order to open a conversation about child survival? Are either of these two even necessary? Does it necessarily follow that by embarking on an ambitious running stunt that it will have enough significance as to open a meaningful conversation? Or to put it another way, would the resources of time, effort and money be better spent in organisation this conversation? And secondly, is this conversation about child survival even necessary, given that there is so much discussion on the world’s stage through institutions such as the United Nations about the issue of Sustainable Development Goals? Again, to add to the conversation here I’m going to refer to the Brazilian philosopher Roberto Unger as I did in my previous two posts, and again take his writing slightly out of context but in such a way so that it still has a useful application. Unger’s writing warns us of what he refers to as the ‘illusion of false necessity’, which is to say that a model or way of seeing is so structurally strict that it doesn’t allow the occurrence of any other adjacent possibilities. The question I am asking here is whether I have become fixated on the running stunt at the expense of the task itself? I can see that there are better ways of going about the journey I have travelled to date, but I am also mindful of the richness of experience that came through the hardship and new horizons that I encountered during this quest. Without that hardship and expanded horizon, my awareness as to what is possible would be stunted and limited which would not be in the service of the task. Retrospectively, it would be possible to see where I got it wrong and how I could do it better. That is a process called learning. Without the advice from others or my own experience, I must first explore and discover to find out. I think it has been necessary because the closer I get to this conversation about child survival, the more I am aware of how enormous the body of work and experience that already exists. We should not be aiming at reinventing the wheel, but rather learning from experience to make a useful contribution. Getting this process right I believe is a balance between the stunt and the conversation. I don’t believe I have succeeded there to date, and that is why I am again lining up for first a rehearsal exercise in March to work out how to do this most effectively ahead of a final push where we hope to bring this conversation to a head in September and October next year. And there is a paradox in terms of what I am seeking to achieve from all of this. Again, my old school mate Phil prompted me to consider this yesterday by asking whether there might be some simple and small things that we could be doing that of themselves would have a disproportionate impact to improve child survival. I don’t know what those things are. And to be honest, I’m not sure whether for all of the conferences that have been held around the globe to date that we have really cracked this code. It is an audacious claim, to the point of arrogance, that I propose that through these Design Forum next year we might unlock new potential to reduce child survival. Why wouldn’t that be the case? Breakthroughs happen all the time in many different fields, and not always by the ‘experts’ or the institutional gatekeepers. What is almost without doubt is that the answers, if we can find them, will be found from engaging with people who are most affected by the problem. We will need to draw upon a broad network to find out those things that we don’t know and then through a process of design thinking put together this information to potential arrive at new solutions to make a difference. There are game changing ideas to be found. Unger declares in his writing that “deep transformations can begin in small initiatives.” So why shouldn’t we believe in the efficacy of what we are trying to achieve? What have we got to lose by trying? My mate Phil pointed out that it is probably in the small things where a solution that will create a tipping point could be found. What if in the process of conducting these Design Forum we could unlock 10 small but important actions that through the combination of these being applied together they have a game changing impact? It’s the small things that matter. This entry was posted in Change, Inspiration, Roberto Unger and tagged Child survival, Inspiration, Roberto Unger, Running, Transformation.